This week our host is Barb from The Everyday Home. But before I turn it over to her I'd like to tell you a bit about our week. This week is the annual Bike Fest Week at Myrtle Beach. 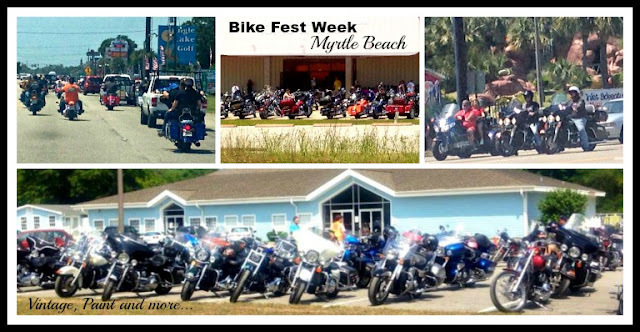 Bikers come from all over the country to participate in this. It's really quite a sight to see. Papa always goes down to help park bikes at our church parking lot. It's totally unreal how many are here - I heard they expect 10,000 this year. The fest sort of takes over the whole area for this week and the residents tend to do only what they have to do since it is so crowded. It's really fun to go down and just watch all the pimped out bikes and bikers ride by. It is definitely an amazing sight - so many beautiful bikes. Tomorrow is the last day and I must say we will all be glad to get back to normal. So what has been happening in your neck of the woods? Hello Everyone! Barb here from The Everyday Home, excited to be back here as your co-host this week. Welcome back to Share It One More Time Inspiration Party #34. I have been super busy at The Everyday Home, I am in full-on Summer mode. Our garden is coming along beautifully and I will be sharing my "Bee Garden" later. I am creating some great projects to share with you for our "Americana" themed Summer porch. I also shared my new Garden Organizing Cabinet, and introduced my newest Chalkboard Printable. and Garden and Travel posts, too. Now, it's time to meet all of our Party Hosts. We would love it if you follow us.